Oberon is Zvork’s flagship product. It is a synthesizer built to explore and produce the fattest of sounds with uncompromised audio quality. Based under the hood on an optimized additive engine, it delivers totally alias free audio with a familiar user interface. Multipoint curves for envelopes, waves and filters. 3 modulation and 1 amplitude envelopes, all loop-able and tempo synced. 8x Unison and Octave virtual voices per oscillator with pitch detune and stereo spread. 8x separate stereo audio outputs. Two oscillators with predefined wave sequences. Editable wave sequences with start and end wave forms. Manipulate oscillator spectrums with bend, harmonize and partial clipping. 6 line modulation matrix with 2 destinations and scale. Curves are a central part of the Oberon workflow and they all share a common set of features. Used to define envelopes, wave forms, filter responses or complex spectrum pitch bends, these multi-point curves all share a common feature set and are all edited in the same central display. Oberon offers 3 modulation envelopes and an amplitude envelope, all defined through a multi-point curve, with up to 16 points. All envelopes can be looped between the first point and the sustain point. For even more funky rhythms, the duration of the envelope sections can be synced to the current song tempo. 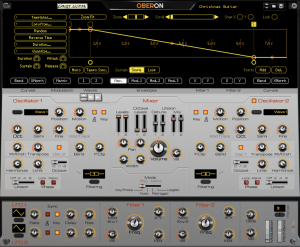 Oberon’s two oscillators are totally identical. Based on additive synthesis, they produce zero aliasing. For the same reason, they are capable of producing periodic and non-periodic waveforms. Finally, these oscillators output directly in stereo, each with an individual pan and width control. Each oscillator can play a wave sequence from a predefined set. From screeching metal to more classic saw-tooths or pulses, these wave sequences can be tempo-synced or played in reverse at different speeds. While the number of wave sequences can seem limited at first, the first two are editable: both start and end wave forms can be totally redefined to your liking or even randomly with a multi-point curve. Need more wave creation tools? Oberon 2’s two editable wave sequences come with wave modifiers that further modulate your hand drawn waveforms. Use this to add frequency modulation, phase distortion, clipping distortion, bit reduction or analog style oscillator sync. Since both start and end wave forms have separate modifiers, you can go really experimental by morphing between FM sounds and analog sync! Oberon 2 allows you to import any audio sample as a wave sequence in both user waves. Use this to create evolving sounds, import custom drawn single cycle wave forms or traditional acoustic instrument samples to mangle with Oberson’s spectrum modulation features. The two filters found in Oberon are not your classic subtractive filters. Forget your predefined modes like low-pass, high-pass or band-pass: the Oberon filter responses are totally editable. With the help of yet another curve, you can create your own custom filter responses from steep low-passes to formant-like multi-band passes. You can even create weird comb filters with the “repeat” function. To fatten your sounds, each oscillator can be virtually duplicated up to 8 times with a pitch detune. After that, if this isn’t enough, another virtual copy of the resulting sound can be added to your final sound mix at an octave higher. As the term “virtual copy” coins, all this is extremely efficient on your CPU. This special feature lets you smoothly morph between two sound sources, potentially of different pitches and timbre. Morph between a pitch downed version of the same oscillator or between oscillator 1 and oscillator 2 for original transitions. The morphing effect can also be masked for certain portions of the spectrum if, for instance, you want to apply the character of one sound source solely to the high frequencies. 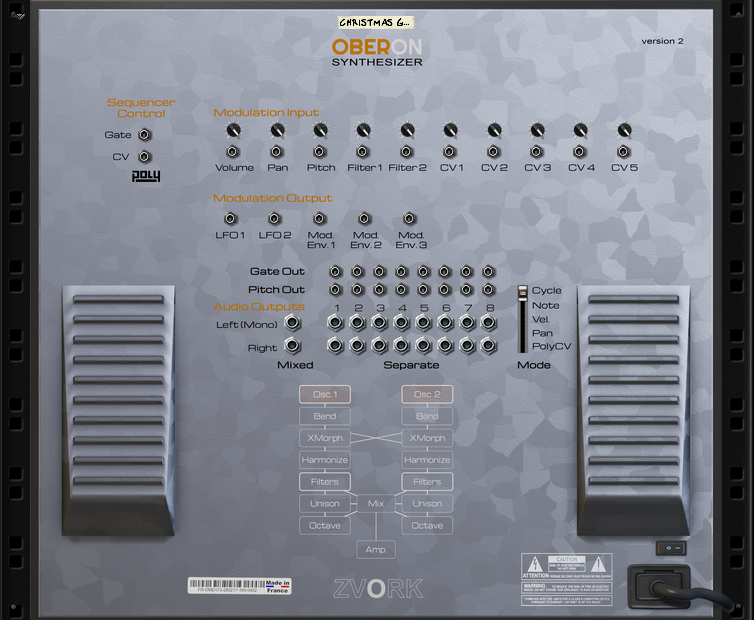 To make your sound come alive, Oberon comes with a classic 6 line modulation matrix. Each line lets you link one of 23 modulation sources to 2 destinations, with individual modulation strength, both scaled by a final modulation source. 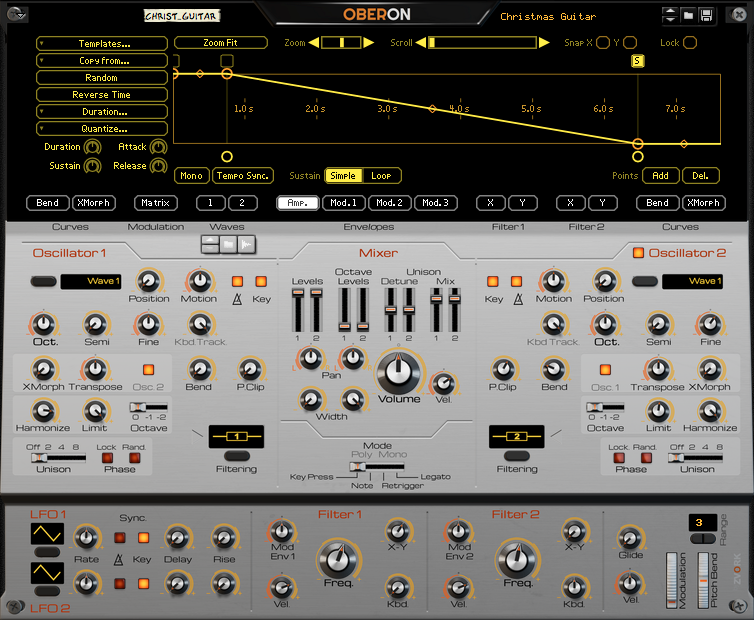 Oberon also has two LFO’s, that can also be tempo-synced, with a wide amount of wave forms. As in the heart of Oberon lies an additive engine, modifying the sound spectrum in unconventional ways is easy. The bend function gives you the possibility of detuning each individual partial of your timbre with the help of an editable curve. And if you feel your waves sound metallic or out of tune, just apply a touch of “Harmonize” to squeeze it back to a periodic waveform. For a grungier, dirtier and brighter sound, partial clipping can be used to level up the low level parts of your spectrum. On the back panel you will find 8 separate outputs for both stereo audio and CV gate. Individual voices can be distributed among these outputs. 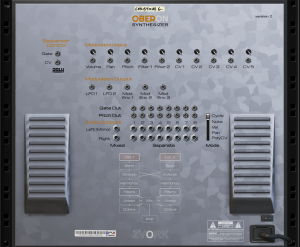 Oberon fully supports Blamsoft’s PolyCV polyphonic CV cable protocol and fully integrates with their Polymodular system, with a dedicated separate audio output mode. 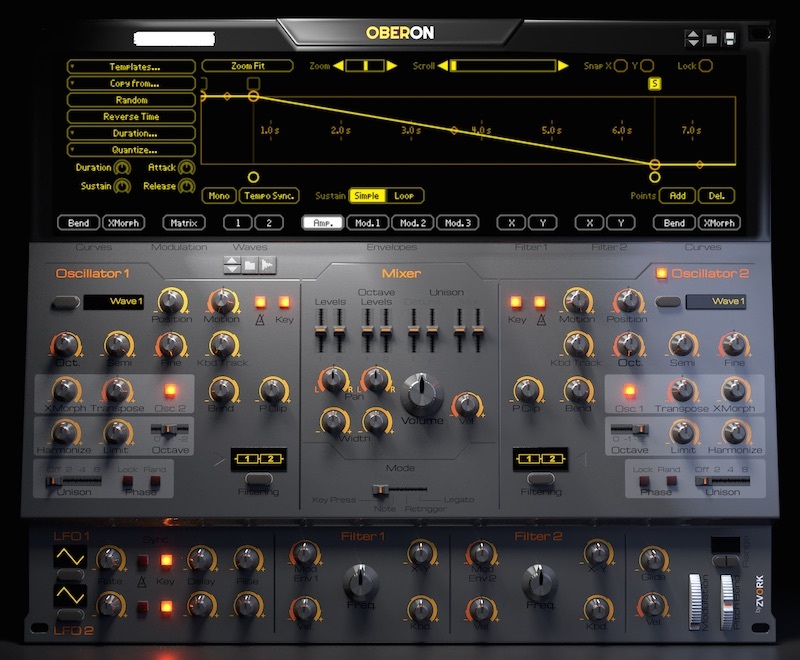 Oberon 2 is available for download at the price of 99€ / 99$, as 19€ / 19$ update for Oberon 1 users or for a free 30 day trial period at the Propellerhead Shop.